Monument of Toyotomi Hideyoshi (1536 or 1537-1598), one of the three unifiers of Japan, in front of Osaka Library at Nakanoshima Park, Osaka. 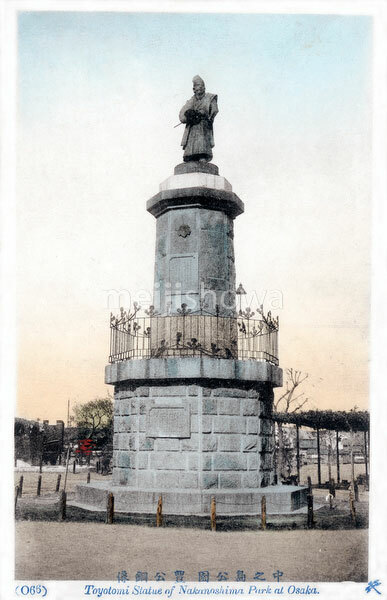 The statue was originally erected at Osaka Castle in 1903 (Meiji 36), but moved to the location on Nakanoshima soon after. In 1943 (Showa 18) it was melted down for the war effort. A new statue was created in 2007 (Heisei 19) by sculptor Shinya Nakamura (中村晋也, 1926). It stands at Osaka’s Hokoku Jinja Shrine at Osaka Castle. Interestingly, this shrine originally stood in Nakanoshima as well. It was completed there in 1879 (Meiji 12) after an 1868 (Meiji 1) order of the then brand new Emperor Meiji. The shrine was moved to its current location in 1961 (Showa 36).